Visualising Wind and Convective Forcing Driving Climatic Dynamics. Follow-up on previous analyses by Diego Fdez-Sevilla PhD | Diego Fdez-Sevilla, PhD. Throughout the line of research presented in previous analyses, wind has been a constant presence. In order to ease the transmission of concepts and ideas, I have made an effort into designing a methodology capable of representing a mental image of my thoughts. In this publication I have used imagery from recent data, and extracts from previous analyses, to visualise the role that Wind plays in the whole study. Now, the mental images that each one of us build are based on the information and knowledge that we have available and apply to create it. Therefore I want to address some general concepts first. All those concepts and dynamics shape the behaviour of our atmosphere, and I have applied them in previous analyses. In the latest part of this publication I recapture paragraphs from previous analyses published addressing the implications from seeing specific atmospheric conditions described by wind conditions. As a final thought, some recent publications by NASA are pointed out and discussed looking at their significance assessing wind behaviour and global circulation. Air currents effect on local air circulation. The sunlight heats the surface of the Earth. Due to clouds and nights, the surface is not uniformly heated. It has hot and cold areas. The hot areas heats the air above it. Hot air is light, so the air raises – Elsewhere the cooler areas cools the air above it. Cold air is heavy, so the air descends. The rising hot air has little weight and puts a low pressure on the earth below. The descending cold air has much weight and puts high pressure on earth below. Masses of air moves from areas with high pressure to areas with low pressure. This movement is called “Wind“. On the weather map below below lines are drawn through all the points having the same pressure. Lines with same pressure are called “isobars”. The standard pressure is rated at 1013,25 hPa (hectopascal). Isobars drawn close to each other indicate big difference in pressure over a short distance. This creates strong winds. Isobars far apart, on the other hand, indicate calm. On a global scale, the wind has a general pattern, even though there are some variations in Winter as when compared to Summer. Below is a map of the Global wind systems, showing prevailing winds having been used by sailors for hundreds of years. The pressure gradient force (PGF) sets air in motion from High toward low pressure. Coriolis deflects that moving air to the right of the direction of motion. Imagine standing on the High center, facing the Low center. Now hold out your right hand, which will point in the direction of Coriolis deflection. In the upper atmosphere, PGF and Coriolis combine to cause wind to blow parallel to the isobars. At the surface however, friction counteracts the Coriolis force somewhat making the resultant wind (the actual wind direction) flow slightly toward the Low and away from the High. Wind blowing in a circular path around the High pressure center would flow in a clockwise direction. Similarly, wind blowing in a circle around the Low center, it would flow in a counterclockwise direction. That is true of the Northern Hemisphere, and the opposite happens in the Southern Hemisphere. Satellite Meteorology. Weather Forecasting. Highs and Lows. General pattern of air flow around low and high pressure. A large blue H is used to indicate the center of high pressure areas on a map while large red L’s mark the center of low pressure. 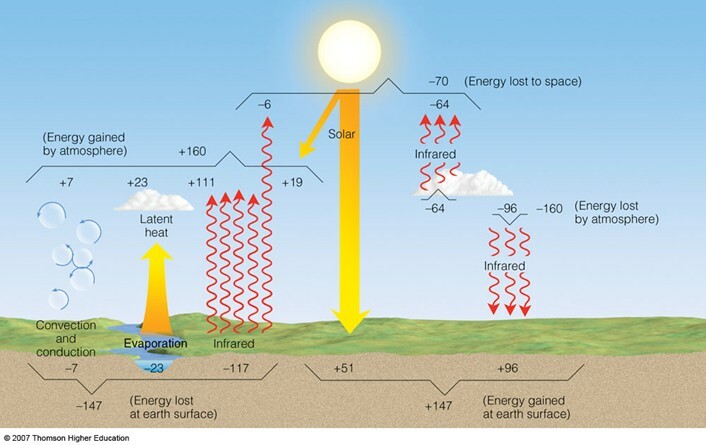 Solar Energy and Energy Balance in the Atmosphere. 14th March 2018 Pressure at Mean Sea Level and IR. Low Pressure in Blue while High Pressure in Red. Inverse values showing air direction. Continuing with the open review over the line of research presented in this blog. We have been increasingly facing -at the same time-; “heat waves” Polewards, displacing “cold waves”, without a positive ENSO phase or the Polar Vortex broken. There is one scenario where this is contemplated. Meanwhile mainstream looks at variations in temperature and associated events using localized warming processes (Arctic and /or Eq Pacific) driving global temperatures, I have focused my analyses over the source of the energy fuelling atmospheric processes as those seen by latent heat generating convective forcing. My analyses assessing processes of energy transference from inert form into the state of free energy, point to an increase in work. Energetic dynamics such as Evaporation, precipitation, lightning, as well as warm (from mid-latitude) and cold (from the Arctic) displacements across latitudes as well as SSW in altitude, driven by convection, resulting in an increased pattern of “global mixing”. Arctic Amplification and Antarctic dynamics. Follow-Up. Since 2014, for four years I have been sharing analyses over real time dynamics at weekly basis. Such agenda has generated a calendar of studies linking assessments over atmospheric dynamics with particular periods of the year. It is my belief that altogether there is a pattern built between all those assessments and periods of time. I would like to call the attention over specific locations and dynamics pointed out in my assessments over the atmosphere in order to contrast their consistency with current dynamics. An important concept in the study of our climate concerns the idea of air flows moving in the atmosphere. These air flows are generated by thermal contrasts and are the ones responsible for the mixture and dispersion of gases and aerosols. It is the mechanism that tries to homogenize the composition and thermal gradients of the atmosphere at each hemisphere and around the globe. A streamline is a path traced out by a massless particle as it moves with the flow. And our atmosphere is a constant tangle of flows carrying gases and aerosols which we can trace. As air flows throughout the atmosphere atmospheric waves are often generated describing the dynamic behaviour of a fluid. Accordingly, those patterns are quite similar to ripples in a pond or eddies in a river. But furthermore, if the flow is laminar (like straight hair) or turbulent (curly hair), it can also give us indirect information about the thermal conditions (stability, etc) and homogeneity in the composition (water vapour… ) of the air. And changes in those visual patterns usually help to locate “factors” generating weather events (e.g. weather fronts, cyclonic circulation and adiabatic processes). Those can be when two or more different (thermally or water content dry/humid) masses of air get in contact or even when orographic features interfere with tropospheric circulation inducing changes in those air masses due to e.g. changes in pressure and thermal gradients in altitude. The use of visual media can be approached in very sophisticated ways applying mathematical interpretations of several variables. However, the capabilities of algorithms are limited in order to identify patterns and sometimes, it is the human eye combined with the power of the brain what make the most of visual materials. 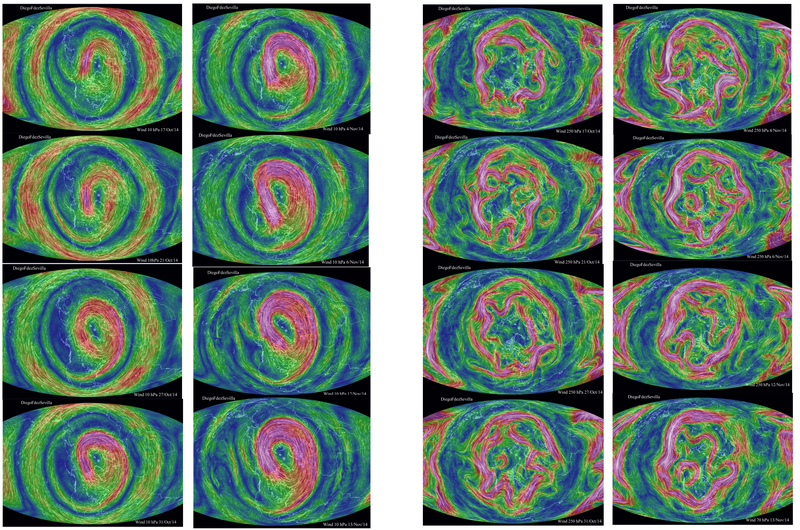 These images help to visually identify the state of the atmosphere in those locations where the plume of molecules under visual and infra-red wavelengths describe the laminar conditions of the air currents carrying those molecules (gases and aerosols). Similarly, these visual properties which are applied in climatological and atmospheric studies are also the ones scientists and engineers use when they talk about wind tunnels. Combining visual conceptualization with numerical analyses and models we look at the movement of the air in our atmosphere and its composition, trying to understand its behaviour. That help us to study globally the patterns of weather events that makes what we call our climate. how can the strong capacity of human activities to transform the composition of our air, soil and water influence the drifting patterns of our near future climate. In our global ecosystem, there is a debate about if there has been an increase in heat or temperature. Which would be the mechanisms of resilience in our global environment working to absorb or release those increases in heat or temperature? I would go with water as the heat/energy carrier and the weather systems as the physical mechanics to redistribute and release heat/energy. Like stirring a spoon to cold down your soup. So I like to see the use of “storage of energy by the climate system” used to determine the range of climate perturbations in the IPCC report on Climate. The theory of Arctic Amplification has introduced the considerations over feedback effects associated with temperature, water vapour and clouds due to changes in the surface albedo feedback—the increase in surface absorption of solar radiation when snow and ice retreat—often cited as the main contributor. The theory that I have developed follows “in alignment” with the work published previously by scientists Judah Cohen, Masato Mori, Colin Summerhayes, Coumou and Ted Shepherd. Their work supported the theory of that early snowfall over Asia increases albedo leading to heat retention in the atmosphere provoking Arctic ice to melt. Their approach point to decreasing snow cover as the cause diminishing albedo enhancing heat absorption. Ultimately, their approach theorize that such enhanced capacity of the Arctic to absorb heat would lead to “amplify” atmospheric heat absorption already being fuelled with GHGs. And therefore, such increase in atmospheric temperature would reduce the thermal contrast required for a strong jet stream and consequently originating disturbance in atmospheric weather patterns associated. What I am trying to highlight in my theory are the possible mechanisms which would explain: changes in albedo which support the concept of “Arctic Amplification”, early snowfalls in central Asia, Arctic ice cover meltdown and oceanic increases in salinity and ultimately, the origin of atmospheric blocking patterns and a slow down or “pause” in T raise, unified in single principle: Increasing conc. of CO2 and water vapour induce a decrease in the differential gradients of energy in atmospheric circulation. I am looking at the implications of having the Arctic circulation not “Amplifying” but “Absorbing” constant increases in atm CO2 and Water vapour. In my approach, instead of looking at what happens in the Arctic as the origin of a chain reaction, I look at what happens in the Arctic just as a side effect (with its own implications) of a more wide process resultant from a reduction between the differential gradients of energy driving the atmospheric global circulation, being water vapour the carrier of the energy being dispersed all over the atmosphere. 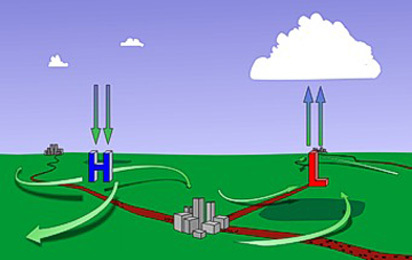 The observed atmospheric circulation at 250 hPa and at 10hPa contributes to support my theory of being the consequence of having a decrease in the differential gradient of energy dictating atmospheric circulation due to a broader distribution of energy in altitude and latitude carried by an increasing amount of atmospheric GHGs and water vapour. The first law of thermodynamics points to that Energy cannot be created or destroyed, it can only be changed from one form to another. Therefore energy can be stored (e.g. Biochemically through photosynthesis into carbon based fuels), transformed (e.g. from chemical to kinetic like the explosion of dynamite) and transferred (e.g. from kinetic energy carried by the wind triggered by adiabatic processes to mechanical energy moving a turbine in a windmill). Potential energy contained by the mass of atmospheric water in its solid phase, snow and ice, or liquid, drops contained in clouds and rainfall. The second law of thermodynamics points to that adding energy into an isolated thermodynamic system, like our atmosphere, would induce increases in entropy as a consequence of dissipation of energy and to dispersal of matter and energy. The state of maximum entropy of the atmosphere would be both a uniform temperature and a uniform pressure worldwide. Clearly that is not the arrangement that we see, the atmosphere is much more complex than that. There is a systematic decrease in temperature as we move away from the equator towards the poles, and superimposed on that a complex and ever changing pattern of weather systems, with storms, high pressure regions, low pressure regions, pressure gradients, gales, etc., etc. All of these represent a high degree of order (a decrease in entropy) when compared to the uniform condition. Increases in atmospheric CO2 have being claimed to store energy in the form of heat raising the temperature of the atmosphere. Accordingly, such development would induce the atmosphere to expand allowing more water vapour to be contained. CO2 storing heat and water vapour carrying latent heat and molecular mass add altogether energy in different forms which, in turn, fuel adiabatic processes, weather events and atmospheric circulation. When considering global circulation, there are patterns of circulation which are built upon strong differential gradients of energy. Warm humid air from tropical or sub-polar regions getting in contact with cold dry air from Polar regions, under the Coriolis effect triggered by the rotation of the Earth, create a current in form of a Jet around the Pole (Lat. 60N) moving from West to East in the North Hemisphere, being called The Polar Jet Stream. In the first instance, it could be assumed that increasing heat and water vapour contained between the Equator and sub-polar regions would increase the differential gradient of energy between sub-polar and polar atmospheric circulation, increasing the strength of the Jet Stream. That would keep concentrated and isolated cold masses of air from sub-polar circulation. Accordingly, the difference between atmospheric temperature in the Pole and in the Equator would be high and increase with more GHGs. However, following the second law of thermodynamics, the close contact and persistence of such area of contact would induce in time, an increase in the percentage of air getting exchanged from both atmospheric areas. That scenario would develop a decrease in the difference between Polar and Equatorial temperatures. Situation which can be already observed in the records available. Here I hypothesise that it can be considered that the volume of the atmospheric system accommodating increasing conc. of GHGs and water vapour has expanded from sub-polar regions into Polar Circulation. Consequently, following the second law of thermodynamics, an added space for those gasses to expand would allow for the atmosphere containing GHGs and water vapour to retain more heat with no increase in atmospheric temperature. Which it could explain why under increasing concentrations of atmospheric CO2 there has been a so called “pause” in global warming. Increasing amounts of atmospheric CO2 and Water vapour would incorporate forms of energy not only into cyclonic events, increasing its strength, but also it would increment the energy in the atmosphere around it. A scenario in which the difference between the energy carried by an atmospheric event and the atmosphere surrounding it is high, the energy in a cyclonic event would dissipate faster, losing strength and resilience. However, we can see in the North Pacific and Atlantic Oceans, cyclonic and anticyclonic events building what it has being called “blocking patterns”, growing from near surface level (1000 hPa) to levels as high as the Jet Stream (250 hPa). For all of these reasons, I see a reasonable link between the recent observed disturbance in the atmospheric circulation of the Jet Stream, without the Polar Vortex being broken yet, and the possibility of being the result of a decrease in the differential gradients of energy between cyclonic events and atmospheric barriers like the Jet Stream. Under such scenario, the Jet stream loses stability becoming wobbly, allowing more frequent exchange of masses of air between both cold and warm sides. (for more discussion in this topic see previous post (Updated 19_Nov) A Groundhog forecast on climate at the North Hemisphere. 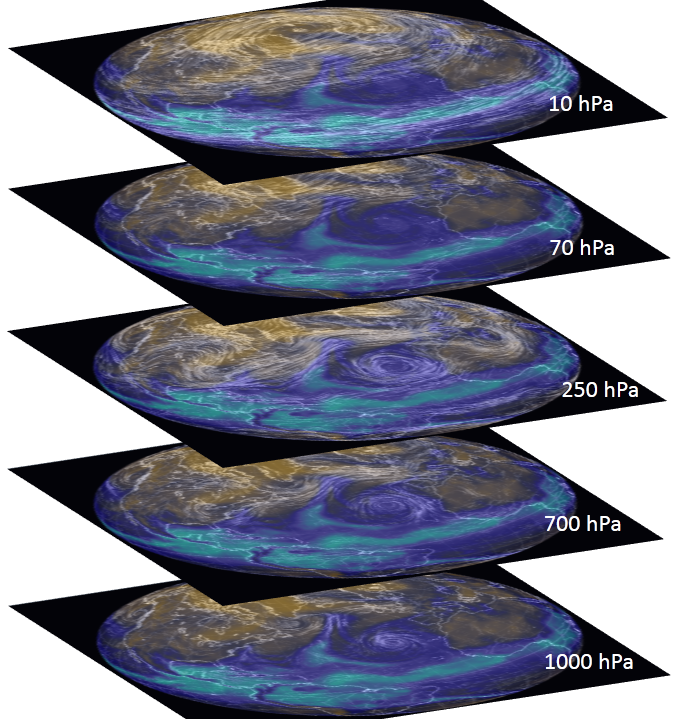 New theory proposal to assess possible changes in Atmospheric Circulation (by Diego Fdez-Sevilla). From the 17 Oct to 13 Nov 2014. (Left) Wind Speed conditions at the North Hemisphere Polar vortex. (Right) Wind Speed conditions at the North Hemisphere Jet Stream. Cohen et al.2011 proposed that early snowfall over Asia increases albedo leading to heat retention in the atmosphere provoking Artic ice to melt and create heat absorption leading to jet stream weakening due to Artic Amplification in atm heat absorption. I believe that all of that is a consequence and not the trigger. That is a symptom and not the cause. In August 2014 Cohen et al, published a review over the state of knowledge on climatic research: DOI:10.1038/NGEO2234 “studies on related topics, especially other observational studies, share some of the same shortcomings: lack of statistical significance, causality unclear, incomplete mechanistic understanding, and so on”. In October 2014 I published my theoretical explanation over the mechanism driving climatic alterations. Following Jennifer comments I offer a review over the theory that I have proposed with new analyses. My theory tries to find common ground to explain the cause leading to Arctic amplification, blocking patterns associated to deep cyclonic events, a pause in atmospheric T raise, increase in kinetic energy dispersed over the whole hemisphere, water flash floods, as well as frequent trans-equatorial circulation between hemispheres at jet stream level. Throughout several posts in my blog, I have explored the connections between Solar activity, Biological productivity, Polar vortex, Environmental Resilience, Inland Water Bodies and Water Cycle, Energy Balance and the Influence of Continentality on Extreme Climatic Events. Based on my analyses I have developed a theory about what I believe it has induced an increase in atmospheric water vapor content and, further I discuss its implications in atmospheric circulation, Jet Stream behaviour and weather system’s patterns. Based on my previous research published in this blog and, the arguments pointed out in various assessment, the implications of having the Arctic circulation not “Amplifying” but “Absorbing” constant increases in atm CO2 and Water vapour defines what is happening at the Arctic just as a side effect (with its own implications) of a more wide process resultant from a reduction between the differential gradients of energy driving the atmospheric global circulation (e.g. inducing a weak Polar Jet Stream), being water vapour the carrier of the energy being dispersed all over the atmosphere, in latitude and altitude. The formation of deep and resilient cyclonic events holding enough energy to affect atmospheric circulation from Surface level all the way up to Jet Stream level (250 hPa). Moisture gained in the Equator getting introduced in atmospheric circulation carried by water vapour into higher latitudes incorporating more energy in atmospheric circulation in the form of latent heat. Notice that the most predominant entrance of water vapour into high latitudes happens in the North Atlantic. Actual state of atmospheric circulation for wind direction and Total Precipitable Water in the atmospheric column today 10th Feb 2015. Data NOAA & Nullschool. Persistent patterns in atmospheric circulation carrying water vapour in the NH Pacific have repeated similar to those from last year’s winter: 2014 Feb and Oct. 2015 Nov, Dec, Feb and March. Atmospheric Dynamics in the Arctic. Breathing IN&OUT. Total Precipitable Water circulation patterns over the North Atlantic and North Pacific Oceans on the 13th June 2015 and 7th Sept 2015. Images generated by Nullschool.net from NOAA NCEP/GFS. The days chosen for this images have been selected to represent the conditions mentioned. The periodicity of the two scenarios is variable and it is not represented by the lap of time between the dates. This work is registered and protected by authorship laws. Atmospheric Dynamics in the Arctic. Breathing IN&OUT. Water Vapour circulation patterns over the North Atlantic and North Pacific Oceans on the 29th August 2015 and 7th Sept 2015. Images generated by Satellite GOES8 WV. The days chosen for this images have been selected to represent the conditions mentioned. The periodicity of the two scenarios is variable and it is not represented by the lap of time between the dates. This work is registered and protected by authorship laws. 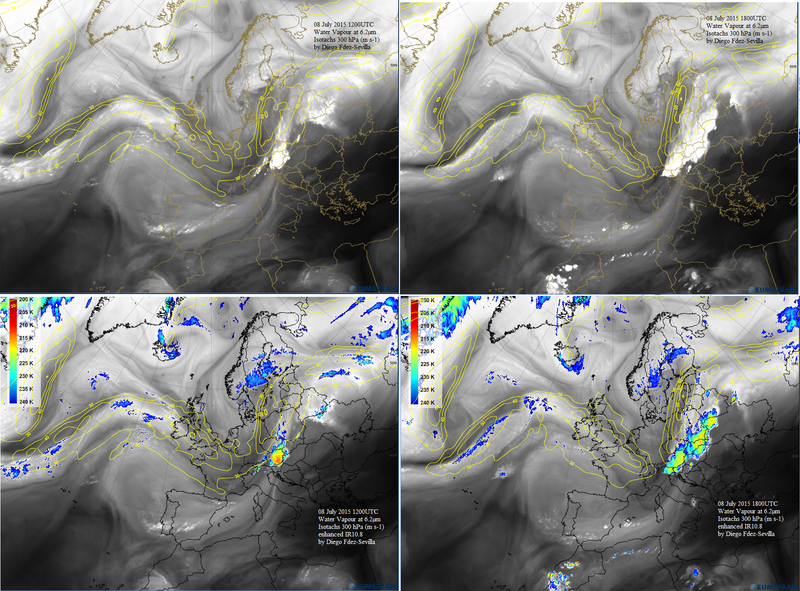 Graphic representation of the atmospheric state and currents in the North Hemisphere for the variables Temp 850 hPa (Top left), Wind 850 hPa (top center), TPW (top right), SST (below left), SSTA (below center) and Water Vapour satellite GOES (below right). The present patterns seen in the circulation over the Arctic, linking Pacific and Atlantic circulations (more also here), are consistent with the mechanisms presented in the theory proposed in this line of research. Furthermore, I believe that these mechanisms point to an interconnection between Atlantic and Pacific atmospheric circulations through the Arctic, which could be dominating the teleconnections identified at global scale and the oceanic and atmospheric phenomena that affect our weather at global scale. If your house, “or planet“, has a high humidity level, simply opening and closing the freezer door (polar Jet Streams) will cause some amount of frost to accumulate. The freezer has a built in heater to melt this build-up in the “Arctic specifications model”, but the “Antarctica model” does not. Graphical representation of the Northward wind velocity at 10m on 8th Nov 2016. Note the alignment of the northern gusts with a tendency moving throughout latitudes towards the Arctic at the Northern Atlantic ocean. “The central role of diminishing sea ice in recent Arctic temperature amplification” by James A. Screen & Ian Simmonds, also “Mechanism of seasonal Arctic sea ice evolution and Arctic amplification” by Kwang-Yul Kim et al. From the beginning of this research I have considered also papers by Cohen and colleges, and Jennifer Francis. And, I agree with their observations but I disagree with their interpretation. When we look at sea ice melting we can consider a transference of energy, but from where to where? Where is the energy coming from to melt ice? Albedo is energy rejected from the system so this energy does not melt ice. You can not justify a decrease in ice based on a decrease in Albedo due to a decrease in ice. Which matter is absorbing and transferring heat into the ice? Ashes immersed in the ice? warmer surrounding water? atmosphere? What happens when one volume of mass transfers heat to another? It gets colder, so the atm column is warmer in surface colder in the middle and warmer again in altitude, always in relation with its surroundings. “Increased transfer of heat from the ocean to the atmosphere resulting from sea ice loss” means that sea ice is melting in a process where sea ice releases heat!!! That is against any thermodynamic coherence and understanding, despite of being in peer review articles and from recognised scientists and institutions. I am sorry but I can not agree. Temperature is measured through an atmosphere with a molecular composition thermically active. The atmosphere is nitrogen, oxygen, and argon. The molecular composition which absorb and retain radiation affecting climatic regimes and ice cover anomalies are GHGs (CO2) being water vapour the major component as part of a feedback with the other GHGs. Through periods of low radiation (winter) temperature drops enough (as in the Arctic should be) so the molecular composition would be mostly N and O without water vapour since it would freeze. So the atmosphere in itself looses its thermal conductance by drying out. How ever, if there is a forced increment of GHGs, like the increase in water vapour measured in the latest decades, the thermal conductance of the air increases, carrying more energy in circulation by water vapour. Being increased the pool of energy carried at the Arctic decreases the amount of energy which the atmosphere can absorb from the oceans. Water releases energy until it freezes only if it the surrounding medium can take all the energy supplied by the ocean. Otherwise it absorbs energy only up to thermal equilibrium. If this equilibrium is higher than freezing there is no ice. My research points to an increase of the energy pool in the atmosphere carried by water vapour as consequence of transformations induced in the composition and structure of the gaseous, liquid and solid phases of our environment, from increases of CO2 in the gaseous phase, transformations in energy sinks due to land cover management in the solid phase, and alterations over water cycles due to compartmentalization, inland water losses, acidification and pollution. An increase in the energy pool of the atmosphere explains ice loss in the Arctic, ice increase (at the moment) in the Antarctic (differences in land-ocean contrasts with NH), increasing number of events related with strong winds, water downpours and snow fall, heat waves and cold displacements crossing latitudes instead of having smooth transitions through longitudes. Based on what it has been discussed in previous assessments over recent atmospheric developments the mixing ratio is increasing and, even though I believe that it is not going to follow the same pattern through time, at the moment, it seems foreseeable. In a previous publications in this blog I pointed out already that it is time to be vigilant about seeing similarities on what is happening in recent years. Not based on waiting for big magnitudes to be measured behind things happening but also based on which magnitudes have to be in place in order for things to not happen as well as the mere existence of “mild” features and patterns repeating in time and location. All the patterns observed and discussed through the publications shared over the period of three years point to a interconnection between Atlantic and Pacific basins through the Arctic thanks to the wobbly Polar Jet Stream. Such mechanism generates synchronism between weather events seeing over both basins. Such eventuality was already discussed over previous publications and shows to keep happening through 2016. “My assessments point to conclude that the mixing ratio between masses of air being warmed up at equatorial and mid-latitudes has increased altering the stratification of the atmosphere in its 3 dimensions. That would explain why locations in Northern latitudes might see warmer conditions than those in the south. Or even high contrasts between locations in the same latitude between west and east as we have seen at North America. The possibility of facing a weakening Jet Stream due to a decrease in the Thermal contrast between the Subtropical and Polar atmospheric regions has created scenarios in which the variations in meteorological conditions for a particular location can come without a transition. One week is freezing cold and the next pretty warm. How can that happen? 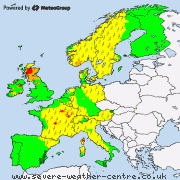 Such scenario can be seen nowadays when we look at the graphic representations created to simulate the prediction for the Western European meteorological conditions in the period between the 3th of March and the 14th of March 2015. Here I have created a video with the sequence of images generated for this period so you can appreciate the forecast describing the behaviour of the phase/limit where both masses of air get in contact and how it looks like a fluid releasing “drops of weather”. I believe that the most visual representation of having the atmosphere increasing its thermal conductivity would be seen throughout the wobbling state of the Polar Jet Stream. As part of my research since 2013 I have been following-up the state of the Polar Jet Stream. This is the latest animation that I have made over the period February 2016 at the Western Europe-East Atlantic. The energy contained by Mid-Latitudinal masses of air is strong enough to work its way towards the North Pole generating warm anomalies in the Arctic at tropospheric and stratospheric levels. The power expressed for such convective motion is enough to displace Cold Dense masses of air from the Arctic into lower latitudes. The feedback loop resultant addressed in previous assessments is showing throughout this winter 2018. Energy is being released from Latent Heat carried by water vapour at Arctic latitudes (as it can be seen in the Pacific and Atlantic intrusions) and more latent heat is also being released at Mid Latitudes with the intrusion of cold masses of air. Altogether, convective motions moving towards the Arctic are triggering the release of Latent heat simultaneously in the Arctic and at Mid Latitudes. The incoming energy released into the atmosphere has the potential of fuelling more convective motion in the atmosphere to the point of self perpetuation, inducing changes in the ENSO phase and all the other Indexes as well as promoting Heat waves towards the seasonal increase in Solar Radiation. Two recent publications seem to support previous conclusions. Based on previous analyses the patterns observed point to a dynamic in atmospheric circulation where the Arctic is absorbing the perturbation from Mid-Latitudinal pressure. 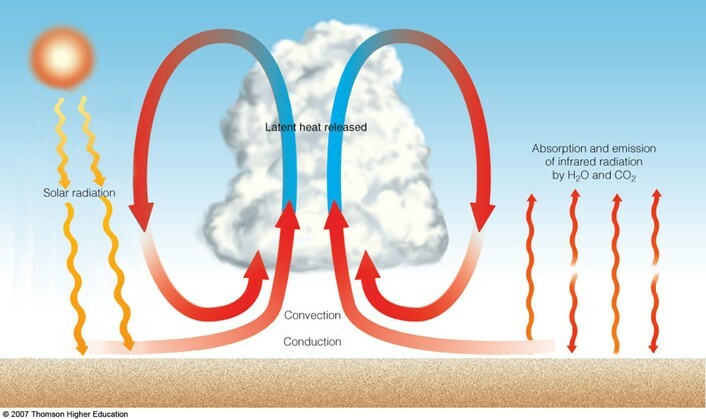 The heat inducing convective forcing promotes invasive mid-latitudinal circulation polewards, carrying warm and moist air which spreads energy as latent heat throughout the three dimensional atmosphere; in latitude, longitude and altitude. * The heat, accompanied by moist air, is entering the Arctic through the sector of the North Atlantic Ocean and also from the North Pacific through the Bering Strait. This week a major Nor’easter impacted the northeast United States on the heels of a particularly windy one the prior weekend. One interesting aspect of this week’s storm was the presence of thundersnow. What is thundersnow, and why does it happen? a compound of the words ‘thunder’ and ‘snow’ used informally to describe an observation of snow at the surface that occurs with lightning and thunder. In the mid-latitudes, thundersnow is prevalent downwind of lakes (e.g., the U.S. Great Lakes) due to sensible and latent heating of the boundary layer, and also in mountainous regions when the environment is sufficiently unstable and/or when significant orographic lifting occurs in preferred areas. Additionally, embedded convective cells producing thundersnow can occur with intensifying extratropical cyclones. Thundersnow can be associated with increased snowfall rates leading to significant visibility reductions and localized areas of higher snow accumulation. The Nor’easter impacting the United States was an intensifying extratropical cyclone. NASA has just published a report on the Jupiter’s Great Red Spot, an atmospheric feature made out of wind from a cyclonic circulation stationary in the atmospheric circulation. There is a concept that I would like to highlight from this report due to its repercussion into understanding other dynamics in another planet, our own planet. The size of things is not proportional to the scale of time required for those to change. That goes with the disappearance of a star, Jupiter’s Great Red Spot, the collapse of a 60 stories hight building, the shape of a mountain or the dynamics in our planetary system. It has taken “a century and a half” for an atmospheric feature to shrink the size of two Earth. Looking at the state of science and its pace covering planetary dynamics, it seems that it is taking longer for our sight to see under daylight than for the Sun to raise. And that has become our biggest issue addressing Climatic alterations, not the lack of data or technology. A study looking into modelling the behaviour of the Jupiter’s Great Red Spot using periods of 30 years average would not be able to predict fluctuations in a window half its baseline. And I am concern that this is what is happening with our climatological studies. The evolution of science has been always marked by the gap between the knowledge that we think we know and the knowledge that we use. One example, it has been accepted scientifically that Energy can not be “created” or “destroyed”, and yet, we live in society under the mindset of “producing” and “consuming” energy. The world of science follows the same growing process as the mentality of a growing person. In order to “fit in” with the rest of society, it gets affected by the rules of engagement dictated by the surrounding pressures of the moment. The “laws” we assume as the ones describing the whole world, actually are only describing the parts of the world that were accessible to the “comprehension” of the moment. In order to comprehend something there is a need for knowledge accompanied by mental maturity. And even then, there is a need for an instrumentation and a language which allow to make new concepts tangible for others. In order to present a new glimpse describing the world you need to elaborate a language to describe it, an instrument to measure it and “acceptance” to “fit in” the “community of knowledge“. The Science of today is made by the remains that survived the struggle of acceptance, as it happened with the library of Alexandria. This entry was posted in Energy Balance, Extreme climatic events, Filling in, Influence of Continentality, Inland Water Bodies and Water Cycle, Polar vortex and Jet Stream, Water vapour and tagged Arctic Amplification, atmospheric circulation, climate drift, Diego Fdez-Sevilla PhD, energy flows. Bookmark the permalink. Pingback: Arctic Warming as a Result of Convective Forcing by Diego Fdez-Sevilla PhD | Diego Fdez-Sevilla, PhD. Pingback: Persistent Mixing Dynamics in Atmospheric Circulation Generates a Seasonal Transition Marked by Kinetic Processes, Exothermic in Nature (by Diego Fdez-Sevilla PhD) | Diego Fdez-Sevilla, PhD.